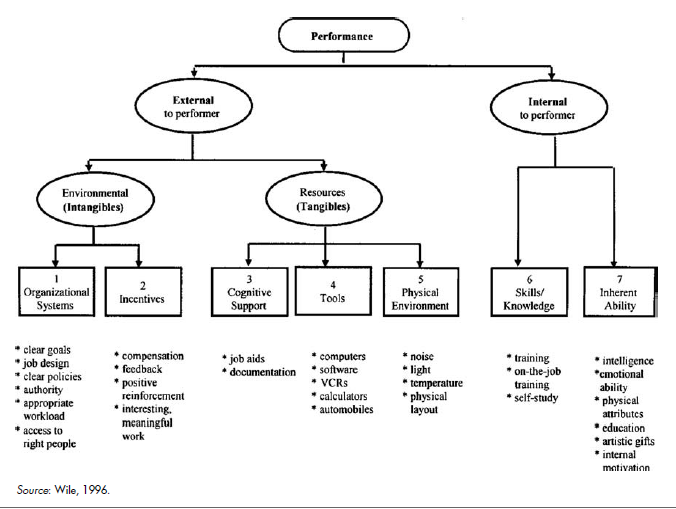 In 1996, David Wile’s came up with Wile’s synthesized HPT Model for examining human performance. In this model he focuses on the external and internal variables in relation to the performer, and then subdivides the external domain into intangible, and tangible categories, specific for each. This model is a unique approach as it offers concrete solutions to unpredictable performance problems. This model also provides identifiers between interventions with specific training solutions. This method makes it easy to analyze performance problems.